In the summer, you can usually find me outside. Whether it’s drinking coffee on the deck at home, reading on the screened-in porch at my family cottage, or eating lunch at the picnic tables outside the office, I try to be outdoors as often as I can. As the weather warms up, many of us choose to spend more time in our outdoor living spaces. In fact, when designing their new home with Lombardo Homes, owners often designate outdoor spaces – like a deck or patio – as must-haves for their family and guests to enjoy! Now that you have that space, you might be wondering how to best decorate it. Here are six essentials for your outdoor home décor. 1) Comfortable seating. This one is a no-brainer. Most of your time on the patio or deck is going to be spent lounging, so don’t forget comfortable furniture! Whether it’s a couch, chair and ottoman, or hammock swing, find outdoor seating that makes you comfortable and is inviting to guests. Make sure you find furniture with removable cushions, so you can bring them indoors when they’re not in use! 2) Outdoor dining set. When I go out to eat in the summer, I look for restaurants with outdoor dining options. Why should eating at home be any different? Invest in a good outdoor dining set – one that can withstand crazy summer rainstorms – so your family can enjoy eating al fresco all season long. 3) Covered spaces. If you didn’t opt for a covered deck or patio when designing your new home, consider adding a small covered area so you can sit in the shade on balmy afternoons. Whether it’s a canopy or giant umbrella, you’ll be happy to have a shaded area to rest in during sunny seasons. 4) Lighting. Sometimes, it’s nice to sit outside all evening to watch the sun set and the first stars appear. And sometimes, it’s nice to have light so you don’t trip over the ottoman. 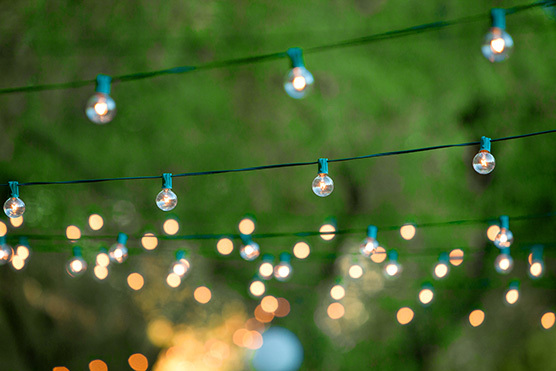 Add a variety of lighting to your décor – like hanging lanterns, string lights, and rope lights – so you can see what you’re doing without losing the outdoor ambience you’re looking for. 6) Citronella candles. Nothing puts a damper on an evening like spending all of my time swatting bugs on the deck – or worse, going inside and realizing I was a buffet for mosquitoes. When I’m outside on warm summer evenings, I’m usually equipped with a good book and a couple of citronella candles. A few well-placed citronellas – combined with good bug spray – can work wonders in keeping unwanted pests away. What are your outdoor decorating essentials? Let us know in the comments!